Bruce Kalb (right), a 2002 graduate of Portsmouth High School, was named as the newest Trojans’ head coach this past week. Kalb played football under Curt Clifford from 1998-2001 and was a part of the 2000 Division III State Semifinalist unit as well as the Division IV Regional Finalist team in 2001. Those teams went 24-3. 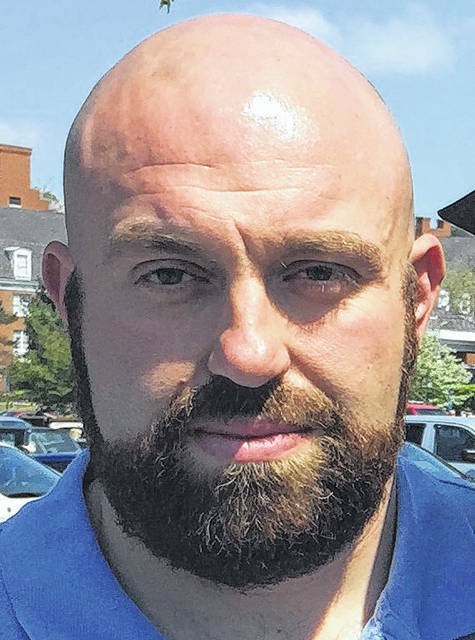 Kalb earned his bachelor’s and master’s degrees in French from The Ohio State University and has been in teaching for eight years. Giving back to a program that once meant so much to one as a high-schooler is always heartwarming. 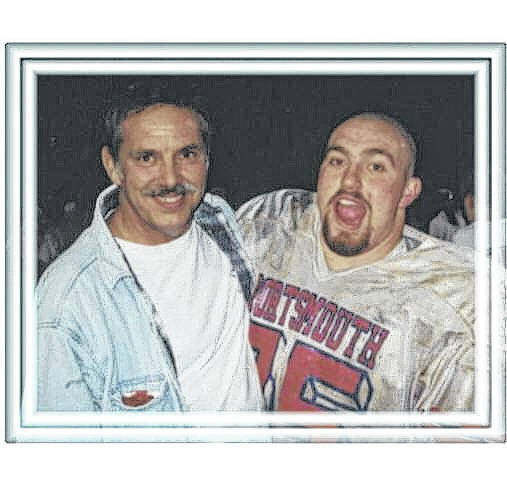 As a former player under former Portsmouth head coach Curt Clifford, and as a 2002 graduate of Portsmouth High School, Bruce Kalb will tell anyone who asks that the Trojans’ high school football program is a big reason why he is here today. Now, Kalb, after serving under former Portsmouth head coach Aaron Duncan for the last three seasons as an offensive coordinator, will get the chance to run a program in his own way and further establish the culture that Clifford, Duncan, and others passed down to him as the former offensive lineman was named as the newest head coach of the program on Thursday evening. For Kalb, who will be entering his eighth season coaching football on the varsity level, the player-turned-coach plans to build his foundation much like Duncan did — on the idea of family. Kalb, who was a starting offensive lineman for Portsmouth, played on two of the best Trojan units to ever be assembled at the school in 2000 and 2001, which went to the Division III State Semifinals and the Division IV Regional Finals, respectively, en route to helping the Trojans obtain a 24-3 record as a starter in his final two seasons of play. That success on the football field not only translated to the classroom, where Kalb obtained a bachelor’s and master’s degree in French from The Ohio State University, but in his professional career. After getting a call from Curt Clifford, Kalb helped out with Portsmouth’s junior high football program on the offensive line, then made the move to Waverly as an offensive line coach under Rusty Wright. When Chris Crabtree was brought in as the head coach in 2013, Kalb — who taught French I through IV at Waverly High School — was promoted to the offensive coordinator role, where he served for two seasons before being hired at the same post by Duncan at Portsmouth. During each of the last three seasons, Kalb — who has helped oversee the development of players such as Talyn Parker, Logan Carter, DJ Pearsall, Colin Boehm, and Anthony Ferrera while at Portsmouth — says that Duncan, who coached Kalb in high school as an assistant on the Portsmouth staff, has only aided his growth and development as a leader of young boys and men. Some of those younger players that stepped into larger roles for Portsmouth — who finished with a 5-5 overall mark and a 4-3 record in Ohio Valley Conference action in 2017 — were mentioned by Kalb as integral pieces that will be vital to the development of the Trojans in 2018 and beyond. Bryson Morrow (5-11, 190) is a junior who made great strides on the offensive front and in the linebacking core, while sophomore Austin McKenzie (5-8, 215) did likewise on the offensive and defensive lines. Sophomore defensive back Ty Pendleton (5-11, 165), who deflected a possible game-winning touchdown pass as time expired to thwart an Ironton rally en route to leading Portsmouth to a 42-35 victory in the Trojans’ final regular season contest, is a guy that will likely be relied on heavily in addition to Boehm and Parker, who were All-OVC talents in 2017. In addition to Kalb, Gerald Cadougan, who has served as an assistant football coach in addition to his duties as a a swimming and track hand, will also continue to serve on the staff. Cadougan, who played as a teammate of Kalb’s during his freshman and sophomore campaigns, is expected to continue in his current role as a coach in the trenches. However, Kalb knows that he, Cadougan, nor the rest of the staff can rest on the laurels that were developed from past successes — because in order to get Portsmouth back to its place among the elite football programs in Southern Ohio, the staff will have to continue to emphasis the qualities of discipline and hard work on and off of the gridiron.